“My name is Daniel. I come from a small town called Morgan, not famous. By famous, I mean real, by real, I mean relevant, by relevant, I mean a connection to you.” Daniel Bernard Roumain believes in declarations, in fact, one the highlights of our An n’ Pale | Café Conversation came when Daniel had us all declare our names in unison. The HCX community braved the cold and mighty wind for a moderated discussion with the acclaimed composer and violinist on Friday, February 20. Moderated by HCX Executive Director Régine M. Roumain, Daniel intimately connected and engaged with the crowd, speaking of the inspiration for his art, his childhood, his mentors, the need for music in schools and his cultural identity. “There’s a rhythm to everything” said Daniel, who has played the violin since the age of six. “I found rhythm in my mother cooking at 2:37 in the morning!”. After the conversation, the audience was treated to a veritable feast of a performance. 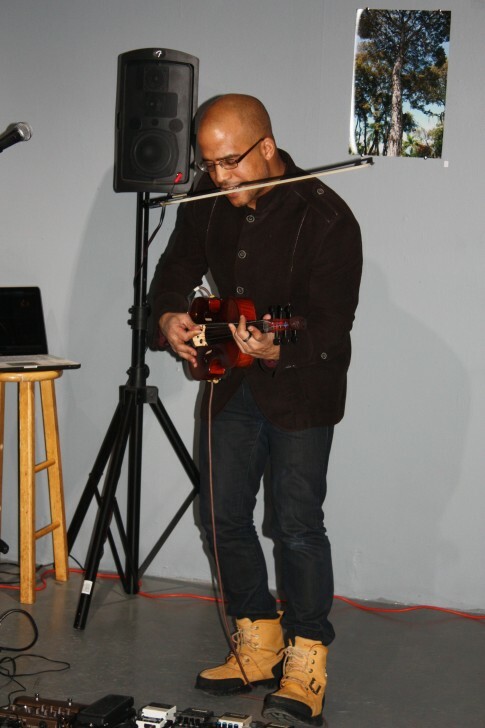 “My violin can be anything” declared Daniel, “I want my violin to breath, cry, laugh, sing, I want to play with my whole body!” The audience was captivated by his eclectically fused soundscapes that incorporated everything from Hip Hop to psychedelic funk. His final piece ‘Bridge’, a haunting lamentation played over an instrumental arrangement of America (My country, ’tis of Thee), invited listeners to meditate on the meaning of being Haitian in America. “I come from a small town called Morgan, Florida” Daniel reiterated at the end of his performance “but my heart, my soul, belongs to Haiti“. Click here to view photos of this An n’ Pale. Click here to learn more about our next An n’ Pale. This entry was posted on Tuesday, March 3rd, 2015 at 6:36 pm	and is filed under An n' Pale, Archive, Events, HCX Programs, Music. You can follow any responses to this entry through the RSS 2.0 feed. You can leave a response, or trackback from your own site.